LNS Research provides advisory and benchmarking services to help Line-of-Business and IT executives make critical decisions. Our research focuses on the Industrial Internet of Things (IIoT), Digital Transformation; and providing insights into the metrics, leadership, business processes, and technology capabilities needed for achieving Operational Excellence. 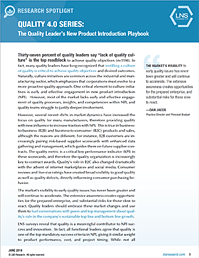 Download a copy of this LNS Research report to learn how to achieve quality objectives and desired outcomes by instilling a culture of quality.